Just like the mural wallpaper and 3D wallpaper, the scenery wallpaper is one of the most attractive options that can instantly create a distinctive impression. Whether it is a waterfall emptying into your living room sofa or a massive pool imagery creating a visual illusion in your bathroom, scenery wallpaper is extensively in demand. But the finishing and installation can make a huge difference in how the scenery wallpaper looks like finally on the wall. So the question is then how can you make sure that you will be able to get the picture perfect finish that you have been dreaming about. Well, this is exactly where we come into the picture; we will help you turn your dreams into reality using our state of art printing techniques and experienced installation experts. We work tirelessly to give shape to the ideas that our clients approach us with. Every concept that we come across is given personalized attention to bring out the best creative representations. Site Visit: The brilliance of a scenery wallpaper is appropriately manifested only when it is accommodated exactly in the available space and is in sync with rest of the decoration in the given area. This is why our designers always visit the site; take an exact measurement and proper assessment before finalizing a design. This makes the finishing a lot more accurate without compromising the design element in any manner whatsoever. The exact measurement also reduces overlapping of features and potential overcrowding. Also visiting the site makes it possible for them to assess if a certain design does not go very well with the existing theme. They can then discuss with the client for any other alternate option. Installation: The next big challenge for a scenery wallpaper is undoubtedly installation of this massive scenery wallpaper. Our huge experience and team of experts make sure that the wallpaper is installed with precision and finesse. That means that there are no rough edges or sudden protruding corners. The wallpaper sits naturally in its designated area and attracts everyone who set their eyes on it. When you engage with us, this is one worry less for you. 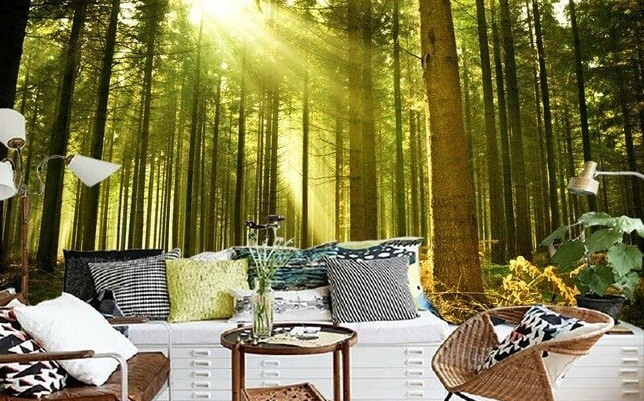 Affordable Option: Given the massive scale that these scenery wallpapers are undertaken, the expense is a major concern. However, we are able to contain it significantly as our in-house designers create them right in our factories using the state of art techniques that we have adopted from across the world. This means the final product is of great quality but does not cost that much. So all you need to do is either call us, email us or simply post a query on our website. We will be able to deliver the most compelling designs at extremely attractive rates with unsurpassed perfection. Our client testimonials and the huge list of repeat customers highlight the service excellence and superior quality that we maintain. Call us now for more information.